On July 21st I was let go from the place I'd dreamed of working since at least 2008. I'm grateful to have been there for the year I was as I did learn much both about massage and about myself. I allowed myself that Thursday to be crushed, to cry, to wallow. By Friday morning I was updating my social media accounts as well as my resume. Their loss will be someone else's spectacular gain! I will admit I'd been recently looking for somewhere to work that would be in line with where I want to shift my focus to - pediatric massage and hospice massage. I was looking in order to fill in my days off, I wasn't going to leave SW. It seems Fate has other ideas. I am trusting the Universe to bring to me that which is meant to be. My RA is better than it was in 2012/2013, but I still have my moments, my days where it's rough. Especially when I don't honor my body by pushing it's limits for a client which I have done from time to time and always paid the price with a day or two of inflammation and pain. This is the primary reason I want to shift to focusing on kids and those who are dying. Any sessions with either of those two areas will have to be gentle, will have to be brief. It will be as good for my body as it will those I want to help take care of. The secondary reason for focusing on those two areas is because they are both underserved greatly, especially hospice patients, people fear death and find it difficult to be around those who are dying. No, I don't find it easy, but I find it heart-filling to give someone some peace and show them gentleness. I get back almost more than I give in a sense. I want to be in massage for a long time - working with those two areas will help me do just that. I can do the work I love and not hurt myself. I can help spread Love & Light and know its needed more than ever. I just need to find where I can fit in. I originally polished my original resume, the one I've had for nearly 10 years. It was only after I finished it that I decided a whole new phase of my life needs a whole new resume, a new look for a new era. I'll be working on that today so I can have it to send out during the week. I will find a place I fit in perfectly. If I don't find one, I will be able to create one. I know that is the truth. 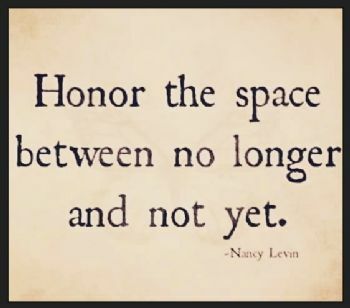 For now, I'm doing my best to do as the quote at the beginning said - honoring the space between no longer and not yet. You will find your place sis. Like you said to me, it may not be what you expect, but it will be where you are supposed to be. You seem like a strong person with the right out look on life. I don't know much about your work field but I would take advantage of unemployment and the time off to work on any training/certs to specialize in kids/elderly since that's your goal.